I started off with an ID-3LA RFID sensor with a USB serial connection to the Raspberry Pi. The device requires an external 1.33-millihenry (mH) antenna. 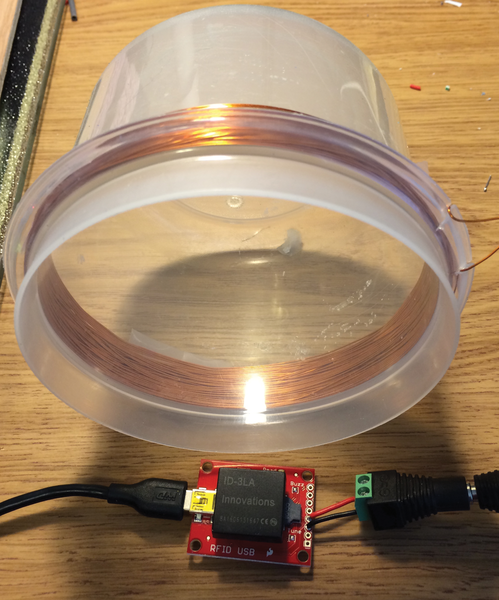 After looking at the web for a while (an excellent source for antenna design is written by Youbok Lee ) I decided to use a circular antenna of 71 turns of AWG24 antenna wire around a 120mm plastic bowl (Figure 2). This setup should give a range of about 10cm. An added advantage of using a bowl is the ability to stick kitty treats inside to entice the cat close enough to the antenna. After completion of the antenna and the accompanying software, I picked up Panther and held him close to the antenna. Nothing happened, except for a quizzical look from the cat. After doing some research, I found a number of incompatible "pet chip" systems at 125KHz, at least in the United States, so I ordered a compatible collar RFID tag to fix this problem. I added an Adafruit PN532 NFC/RFID 13.56MHz breakout board to the MouseAir to get some experience with the device. I found one major issue implementing the NFC breakout board on the Raspberry Pi I2C. The only Python library I could find was written in Python 3, and all the rest of my software is in Python 2. I took a stab at starting a translation, but it was way too much work. Instead, I have started to write a new Python 2-compatible library that I will use in a new project (and release on switchdoc.com and GitHub). I tested the board using the Python 3 software and it worked, although the range was very short (<2cm) with the built-in antenna.